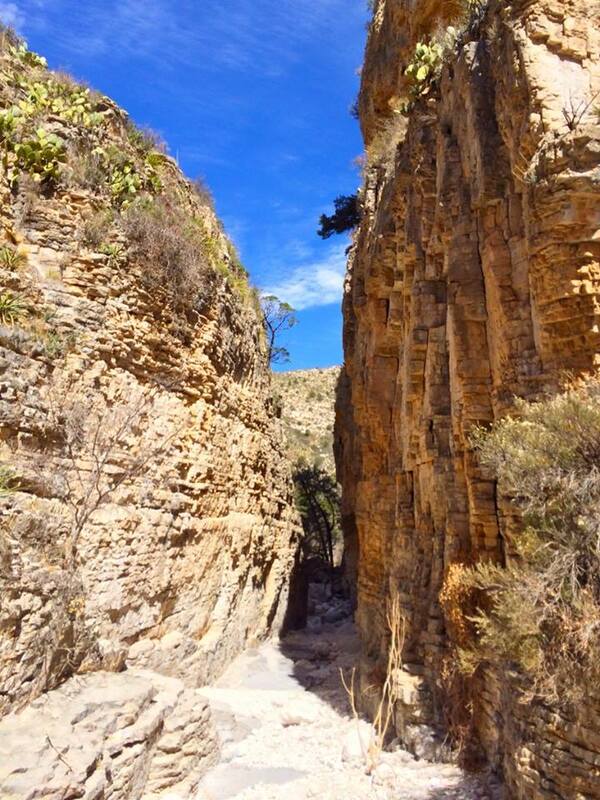 When Mike, John and I hiked Guadalupe Peak, one thing that stood out to us at the beginning of the hike was the canyon that ran next to the campground, Pine Spring Canyon. From the Guadalupe Peak trail we could see down into the canyon and decided that the following day we would try to hike into the canyon, whether or not there was a trail, before heading to El Paso and leaving Texas. 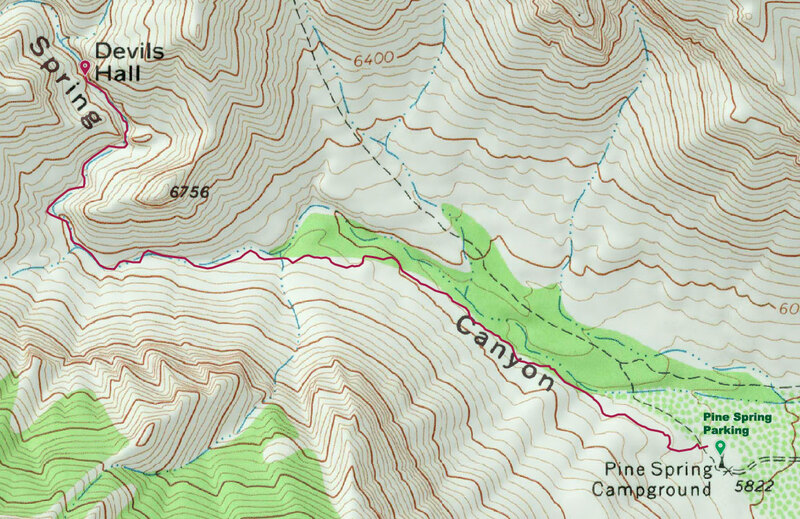 Upon returning to our camp that evening we consulted our maps and decided that the Devil’s Hall trail must traverse the canyon’s floor. Once we had packed up camp in the morning we headed out for Devil’s Hall. The trail was the perfect follow up to the rugged hiking and bushwhacking we had endured the previous day. There was very little elevation gain and the scenery was a stark contrast. Rather than distant peaks and long desert views we were surrounded by sloping valleys, overshadowed by staggering peaks and walking among the cacti, yucca and madrone trees. About a mile into the hike the trail left the canyon’s rim and entered the canyon itself. From there on the trail followed the dry river bed. The river bed was scattered with large boulders, the most efficient route marked by small cairns. We gradually made our way up the canyon, taking our time investigating the rock formations and pointing out the abundant lizards. After a bend in the river bed and making our way through a gap cut through a small ridge (later investigation revealed that the gap was called Devil’s Gate), we came upon Hiker’s Staircase. There was a pool-shaped indention cut into the rock on the river bed backed by a steep, natural staircase. I couldn’t help but imagine what the pool would look like with a torrent of muddy water ripping through after a flash thunderstorm. Mike wouldn’t have standed a chance basking in the bottom of the pool, as if laying on a pool float. A short distance after Hiker’s Staircase we came upon a large cliff aswarm with swallows nesting on its face. I attempted to take some video of their activity but they seemed to have stage fright and stopped their frantic fluttering every time I attempted to capture it. Around a small bend after the cliff was the slot canyon itself, Devil’s Hall. It was my first slot canyon and was rather impressive. It may have been 100 feet high at its tallest and at most a dozen feet wide. The shade and wind that funneled through the slot canyon was a nice break from the Texas sun. We stopped for some photos and an older couple offered to take our photo and we reciprocated. They were the second great coincidence on the trip to Texas. John noticed the man’s Maine accent and Bar Harbor t-shirt. It turned out they were from Eastport. There we were, two groups of people in a slot canyon, miles from the closest road, way out in the deserts of western Texas, and we were all from Maine. After taking a break for some water and trail food we made our way back out of Devil’s Hall and Pine Spring Canyon. It was definitely a worthwhile hike and a good way to mix up the scenery and terrain after spending the previous day up in the mountains. After four days of car traveling, camping and hiking we were pretty rank. We “showered” with some wet wipes that John scored at the conference we attended earlier in the week and then we headed across the Chihuahua Desert to El Paso for our red eye flight back to the northeast. “Devil’s Hall Trail.” nps.gov. National Park Services, U.S. Department of the Interior. Web. 15 April 2014. 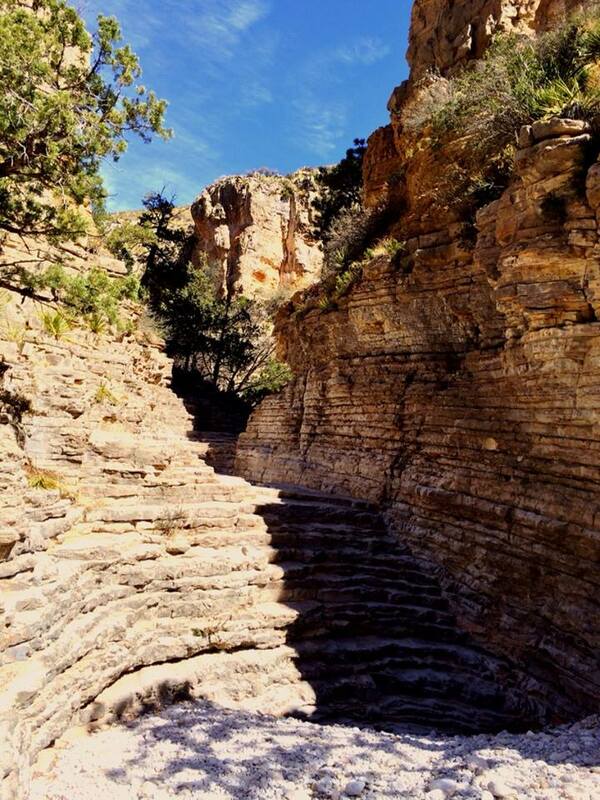 This entry was posted in Hike and tagged Devil's Gate, Devil's Hall, Guadalupe Mountains, Hike, Hiker's Staircase, Mainers, Pine Spring Canyon, slot canyon, Texas. Bookmark the permalink.